Star Wars 8: Will Oscar Isaac Return as Poe Dameron? Last week, Disney finally confirmed that Rian Johnson will be writing and directing Star Wars: Episode VIII, with Disney setting a May 26, 2017 release date for this follow-up to Star Wars: The Force Awakens. Of course, no other details were given in regards to the story, or what characters from Star Wars: The Force Awakens will be back for the follow-up. It is widely believed that the new characters introduced in Star Wars: The Force Awakens will be at the center of both Star Wars: Episode VIII and Star Wars: Episode IX, but the entire trilogy is still shrouded in mystery. Oscar Isaac, who plays X-wing pilot Poe Dameron in Star Wars: The Force Awakens, is doing press for his sci-fi thriller Ex Machina, where he was asked how he felt about working with Rian Johnson in Star Wars: Episode VIII. His answer essentially confirms that he will be a part of the sequel. Naturally, that isn't much to go on, but when asked if he had spoken to Rian Johnson about the follow-up, the actor added, "No, not yet." This obviously isn't the most concrete of confirmations, but given how little we know about Star Wars: The Force Awakens and Star Wars: Episode VIII, at least now we know one Star Wars: The Force Awakens character that will make it out alive. There have been rumors that some of the original trilogy characters like Han Solo (Harrison Ford) and Luke Skywalker (Mark Hamill) may not survive Star Wars: The Force Awakens, but don't expect to find out if those details are true or not until the movie debuts in December. Oscar Isaac also spoke about his experiences in making Star Wars: The Force Awakens, and what it was like to be in an X-wing ship. "It was very cool, but a little nauseating because the thing is on a gimbal and moving all around. I forgot to breathe and I was like, 'Whoa.' But it was very cool." He also revealed that the first movie he ever saw in a theater was Star Wars: Episode VI - Return of the Jedi, while praising director J.J. Abrams' vision for Star Wars: The Force Awakens. "Well the history of it. The first movie I remember seeing in a theater was Return of the Jedi. And then J.J., on top of the whole thing was J.J. (Abrams). Nostalgia can only go so far and at a certain point you have to have someone who has a real vision of what they want to do." What do you think about these new details? 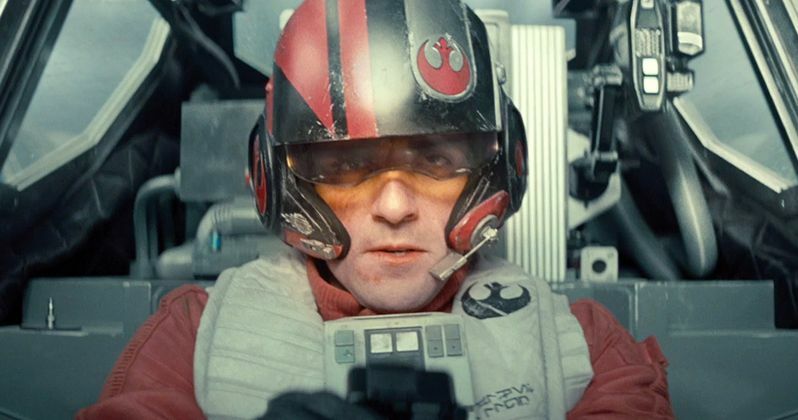 Are you glad that Oscar Isaac's Poe Dameron will be back for Rian Johnson's Star Wars: Episode VIII? Let us know what you think below, and stay tuned for the latest on the Star Wars franchise.